"Oh, George! We've got company!" 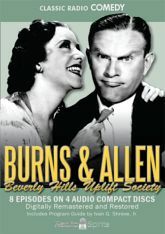 A favorite recurring feature of the Burns and Allen radio program involved George's fruitless efforts to defend himself against the schemes of the Beverly Hills Uplift Society, "an organization of women�for women�by women," led by the zaniest woman of them all: Gracie. This gathering of gossipy females embark on ill-advised escapades - from matchmaking to hijacking the show - all to George's dismay. The society sweethearts are played by Bea Benaderet and Elvia Allman, with jocular gentlemen Mel Blanc, Hans Conried, Elliott Lewis and Gale Gordon as part of an ensemble that set a benchmark for character acting in radio comedy. These eight digitally remastered episodes are complimented by a Program Guide written by radio historian Ivan G. Shreve, Jr. featuring photos and background information about the show.